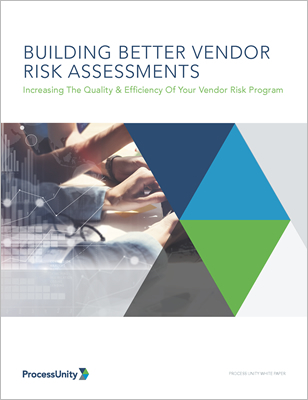 Download our informative new guide, Building Better Vendor Risk Assessments, and you will learn how organizations like yours can improve third-party risk assessments while balancing regulatory pressures, business requirements and budget constraints. Quality - How did you perform against your objectives during the previous year? How can you improve the consistency of your program and other aspects of what you’re already doing? What are the lessons learned? 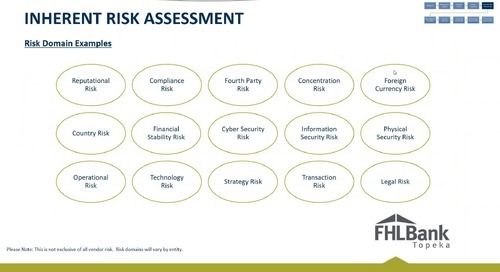 Alignment - Is your vendor risk management program aligned with your business and its regulatory requirements? 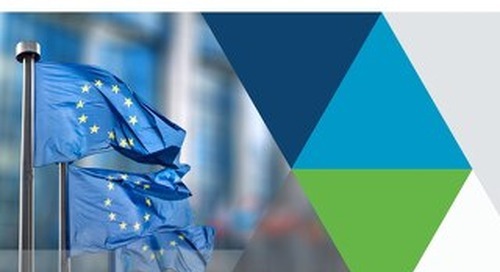 Have you taken into consideration changes in your business and new regulatory guidance? Veracity - Are you testing controls in a way that makes sense and is efficient? 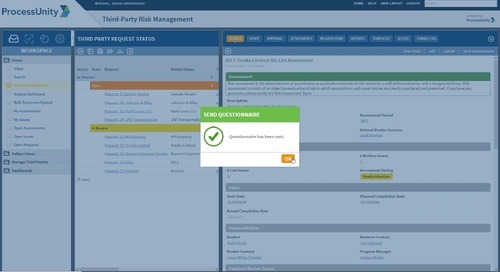 Are you sufficiently testing where the control execution risk lies? Or, are you burning cycles with ineffective or unnecessary testing? Efficiency - When assessing the above three areas, it’s easy to fall prey to scope creep. Are you doing what’s required to keep the program within your resource constraints while maximizing the usefulness of those resources? 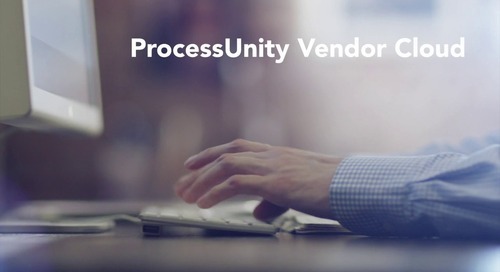 Watch ProcessUnity's 45-minute webinar and see how program automation helps you eliminate tedious processes and breeze through regulatory audits. 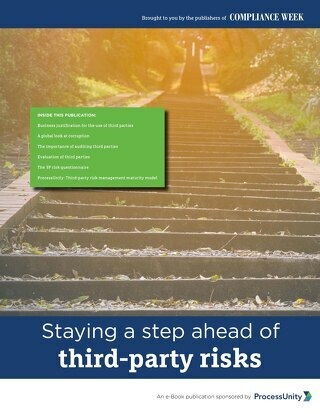 An eBook exploring what companies need to know to thwart third-party risk and stay off the regulatory radar, produced by Compliance Week and sponsored by ProcessUnity. 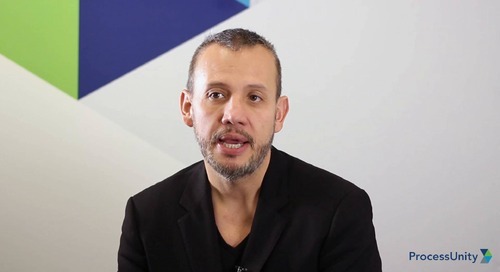 Watch ProcessUnity's webcast replay and learn strategies and techniques that improve your assessment review process and reduce “busy work” for your team and your vendors. 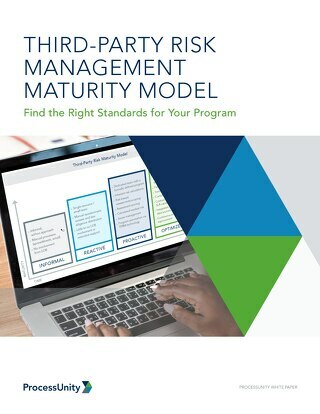 Read Third-Party Risk Management Maturity Model for practical advice on how to advance your vendor risk program regardless of its current level of sophistication. Watch the on-demand webinar from Compliance Week, ProcessUnity, and TruSight and discover the newest techniques for driving third-party risk out of your business. 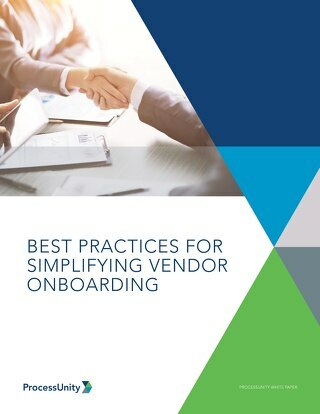 Download ProcessUnity's guide and learn best practices for simplifying vendor onboarding processes. 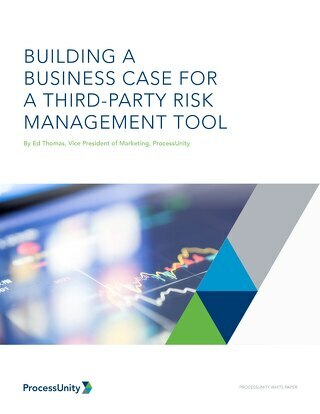 Download ProcessUnity's latest eBook, Building a Business Case for a Third-Party Risk Management Tool for practical guidance on how to formulate a winning business case. 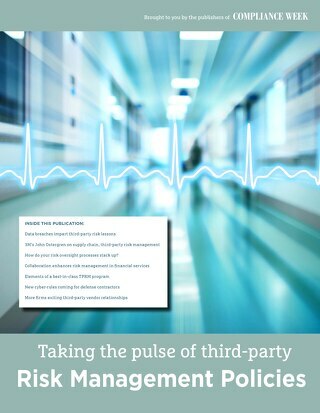 Taking the Pulse of Third-Party Risk Management Policies is brought to you by the publishers of Compliance Week magazine. 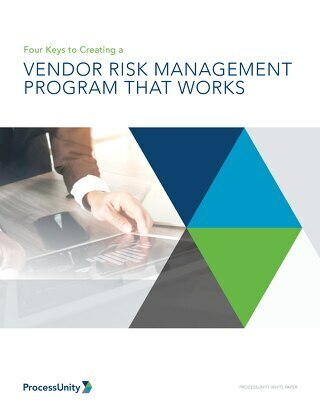 Download "Four Keys to Successful Vendor Risk Management" and learn how to build an effective and efficient program. 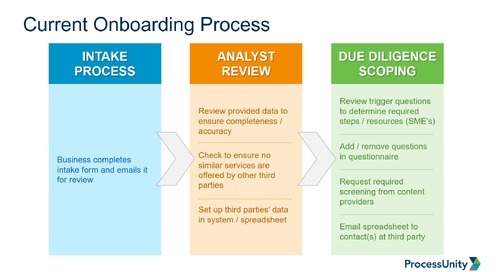 Watch ProcessUnity’s 45-minute webcast and see how forward-thinking organizations are modernizing their vendor onboarding process. 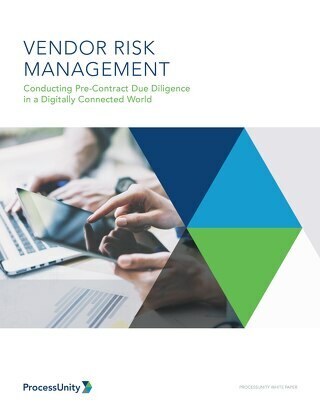 Learn how Vendor Cloud eliminates unwieldy spreadsheets and surveys, streamlining vendor risk management processes for you, your vendors and your regulators. 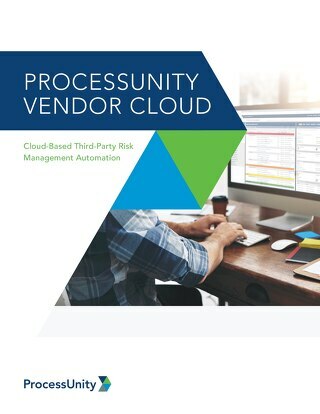 Download the ProcessUnity Vendor Cloud Brochure and learn about Third-Party Risk Management automation. 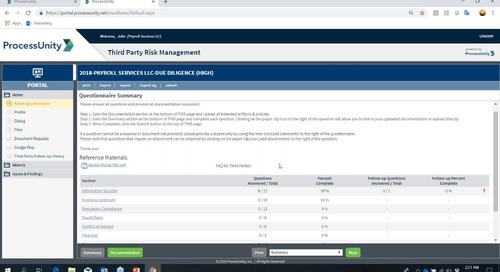 ProcessUnity’s third-party risk pricing plans are designed to fit organizations of all sizes and of all program maturity levels. 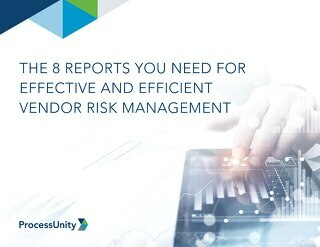 Download "8 Reports You Need for Effective and Efficient Vendor Risk Management" and see how one-click access to the right information is critical for an effective and efficient Vendor Risk program. 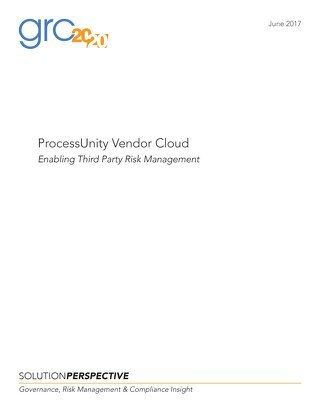 Download GRC 20/20's overview of ProcessUnity's cloud-based solution for Third-Party Risk Management automation. 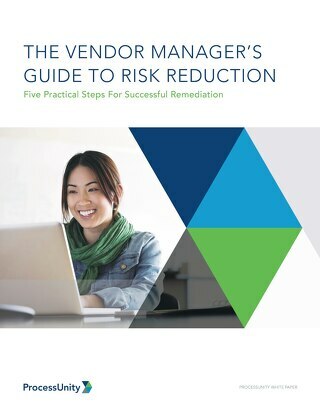 Learn how to get Vendor Risk Management right from the start using pre-contract due diligence.  Companies that outsource are effectively extending their enterprise to include the services of the third parties with whom they’ve contracted. 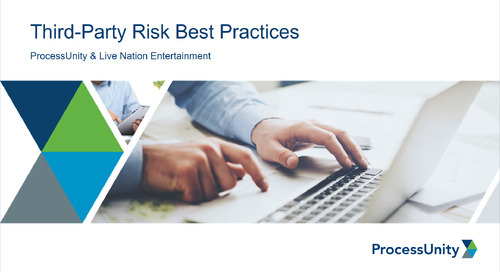 Watch ProcessUnity's on-demand webinar and hear how your peers at Live Nation Entertainment incorporated best practices into their Third-Party Risk processes. © ProcessUnity, Inc. All Rights Reserved.